Our recent interview with Seagate's CTO, Mark Re, gave us an idea about of the future of the hard drive market. As late as Q1 2016, Seagate had considered helium-based drives suitable for high-end applications only. However, the fast-changing competitive landscape, as well as changes in consumer requirements, have made it necessary for Seagate to re-evaluate the options. Today, the Guardian Series, consisting of a portfolio of 10TB helium-based drives, is being launched for various segments in the mainstream consumer market. One of the important aspects to note here is that only the 10TB drives are helium-based. All the drives being launched today are 7200 RPM drives and use traditional perpendicular magnetic recording (PMR) technology. The BarraCuda series also integrates a multi-tier cache, which involves drive-based management of various storage media on the disk (DRAM, flash and magnetic platters). The intent is obviously to improve responsiveness and, to an extent, also lower power consumption. In the Compute market, Seagate is also bringing out a new SSHD (SSD + HDD hybrid) under the FireCuda SSHD branding (now, in both 2.5" and 3.5" form factors). 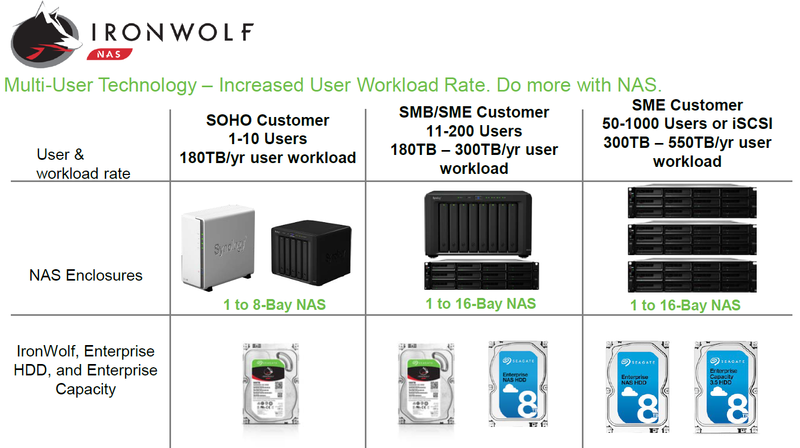 The IronWolf series is focused on hard drives for the NAS segment, currently served by vendors such as Synology and QNAP. One of the most interesting aspects of the IronWolf series is the integration of a rotational vibration sensor in the high-capacity models. This has traditionally been restricted to enterprise NAS drives, and it is a welcome feature. Seagate markets their NAS-optimized firmware under the AgileArray moniker. It includes drive balancing features (vibration dampening hardware control and RV sensor handling) as well as RAID-related features such as TLER (time-limited error recovery) configurations to avoid drives erroneously dropping out of arrays etc. It also includes specific power management features such as optimized spin-down / standby / sleep entry. IronWolf drives also come with the optional Seagate Rescue data recovery service (this is retained from the previous NAS HDD / Enterprise NAS HDD marketing feature set). The final market segment that Seagate is addressing today is storage for surveillance / IP camera / NVR (networked video recorder) applications. This segment is forecast for huge growth, bringing high-capacity drives into the forefront. The SkyHawk series will be addressing this market with firmware optimized for video stream recording (ATA streaming extensions support for up to 64HD cameras) and 24x7 operation. The workload rating is similar to the IronWolf series at 180TB/yr. The firmware also enables quick time-to-record when coming out of idle - something essential for scenarios where recording is triggered only when motion is detected. Helium-based drives also enable low power consumption and lowered heat dissipation requirements. The SkyHawk drives also come with RV sensors and the series is supported by Seagate Rescue for data recovery. For large-scale surveillance storage requirements (say, 100+ cameras), Seagate suggests the Enterprise Capacity HDDs with a 550TB/yr workload rating instead. 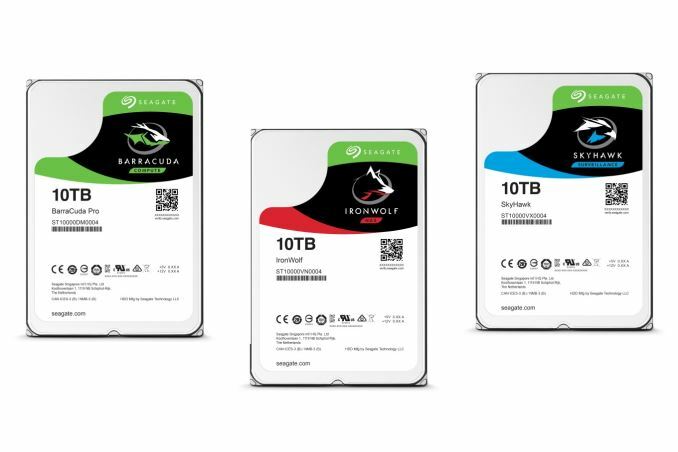 The BarraCuda Pro carries a 5-year warranty, with the 10TB drive having an MSRP of $535. The IronWolf and SkyHawk drives carry 3-year warranties, with the 10TB drives carrying MSRPs of $470 and $460 respectively. Seagate seemed to be late to the helium game, with both HGST and Western Digital coming out with a number of helium-based drives for different applications over the last couple of years. However, with the introduction of the Guardian series, Seagate has wrested the initiative by targeting multiple market segments. In particular, targeting the surveillance market that is forecast for huge growth will help Seagate in achieving economies of scale. That will, in turn, should make the price of drives such as the BarraCuda Pro 10TB more palatable to the average consumer. That's about on par with the largest WD Red Pro drives on a $/byte basis. Depending on how close actual tracks MSRP, could even be cheaper. Where can I get 10TB SSDs for $500-600? It would cost me $6000 (real world price) to have had my backup I bought this April be on SSDs.